I believe you sent the family’s response to the Ombudsman’s draft findings on 2nd February 2016, some two and a half months ago. Considering the Ombudsman has had since summer 2015 to complete the task, I am finding it very difficult to understand why it is taking so long. As you well know, the family has been under huge strain for many years due to the Council covering up the abuse of a child due to wrong diagnosis, and what can only be seen as probably criminal intent. Please forward this letter to the Ombudsman so they can give a clear response, for the record, as to why they have taken so long, considering the dire effect it is having on the child. It is with great sadness that I have to tell you that I can no longer call myself a chiropractor and am not on the General Chiropractic Council register (our governing body). This is not because I have done anything wrong but because they have refused my CPD (Continuous Professional Development) which is necessary for my retention on the register. I believe this is for political reasons. The problem stems from my work over the past 5 years, standing up for a young patient and his family who I diagnosed with Spectrum Autism and Post-Traumatic Stress Syndrome, due to traumatic abuse by Council employees. This is part of a 10-year case study (with others) for the Royal College of Chiropractors. I took the County Council to a tribunal to get my patient the help and support he needed, and won. He was supposed to be looked after until he was 19 and beyond. However, the County Council put him out on the streets on his 18th birthday. They decided not to agree with my diagnosis (and that of others) which had been accepted by the tribunal and not contested by the Council at the time. The GCC were fully informed in a series of letters, and suggested that they would do something due to their obligation to advance and develop the profession. As it turns out, they did nothing in over 3 years, even though they have a mandatory obligation to report child abuse (clearly shown in my letters). Their refusal to help, i.e. by not backing my right to diagnose and refer, and not accepting my CPD for retention of my registration, can only be seen as part of a much larger cover up. Councils, Social Services, Education, and Regulatory bodies are deemed too big to fail. It’s much better to damage the child, and cheaper. I cannot go into detail at this stage due to impending litigation, hopefully criminal prosecution in the future, and the involvement of the Court of Human Rights in time. With the GCC it would seem I have no right of appeal, or access to an independent complaints procedure. I either shut up and toe the line, or am pushed out of the profession, which has just happened. We have run an ethical based practice since 1939 and have given out over 1 million patient treatments to over 90,000 individuals without major complaint, just 1 fraudulent prosecution which was thrown out of court. Again, the GCC had been fully informed and took no action. We are justifiably proud of our record, and in good conscience I could not let my patients down and keep quiet. 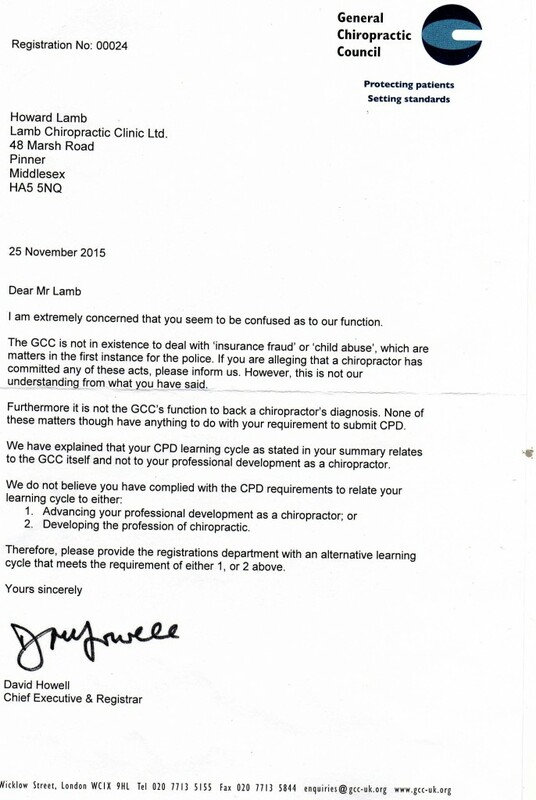 I asked the GCC and my Associations to stand up for my right to diagnose and refer as stated in our protocols and procedures/Chiropractic Act and forward my letters regarding child abuse to the Director of Public Prosecutions, and so far they have not. I have the right amount of CPD hours for retention, however the GCC did not like the fact that for next year’s I would be looking into why they were not able to fulfil their mandatory duties, and decided it was not part of advancing the profession. I need your help to safeguard our family practice by writing in my support and asking why David Howell (d.howell@gcc-uk.org or Mr D Howell, General Chiropractic Council, 44 Wicklow Street, London, WC1X 9HL) has not fulfilled his mandatory obligation to report child abuse, and why he has not been able to support a chiropractor’s right to diagnose and refer. Or, in the New Year, by voting, once I have worked out how to set up an online vote, to apply for a Public Inquiry into the setting up and subsequent running of the GCC, and why they did not comply fully with the Chiropractic Act. Until then, please use this letter to start awareness through social media to highlight mine and my patient’s plight, and this tragic situation which is being repeated all over the country. I believe at the time the Surgeon General stated that these children should not be diagnosed before the age of 6. Apparently the Councils do not want to ‘label’ them, so often they are not diagnosed properly. If you have no children with problems, no facilities are budgeted for or are available for the children, as I have seen. Even when diagnosed correctly, the Council in this case ignored it and repeatedly crashed the child before throwing him out on the street. This is a National disgrace, and the cover-up an even bigger one. I will keep you informed and hope that patient power makes the difference. I believe that I have been in contact with Mr Howell since 25th November, and I believe that my Associations also have on the subject of CPD. Please get your facts straight. The 30 hours that I need to retain my position on the register are ‘with others’ which is quite legitimate, in fact my CPD form is technically correct. I could have added lots of other legitimate hours but as CPD is a box-ticking affair I felt that the minimum requirement would save time and paperwork. Much of my CPD over the years has been based on developing the profession with pioneering work on autism, cerebral palsy and other research and development areas. Last year my hours would probably have been in excess of 150 hours, as it is most years. I believe that the sticking point on this year’s has been the fact that I have been looking (and am continuing to look) into the GCC and why I feel it has failed the profession. If the profession is being restricted it cannot advance. Your attitude towards my CPD is censorship of the worst possible type. Obviously if there are no complaints there are no problems, and if there are no problems you must be doing a great job. Yet when I asked for support of my right to diagnose and refer (page 1 of the CoP states I have this right) to help protect an autistic child who has been abused by the system, through, at best, wrongful diagnosis, you failed me. When I’ve brought up the subject of fraud, again nothing was done. You may not like the way I have handled this but you have not understood the nature of my high functional autism (Disabilities Act and Discrimination Act). Because of your failure I have started to look much deeper into your function and it’s affect on the profession. As regulators I believe you have had instruction to focus on public safety, yet if you do not stand up for the profession how is this possible? The safety of Child X has been in jeopardy for at least the three and a half years you have known about him, yet you did nothing. Whether you like what I say or not is irrelevant as my CPD form is technically correct and you have no right to censor it. I believe that my Associations have explained this to Mr Howell. If he did not get that understanding I believe that I have now made it clear. If you are still unable to process my application, please explain with precision as to why. Saying that you do not feel that it is advancing the profession is not good enough particularly as you are not a member of the profession, just an administrator. I will need to know from whom and what technical advice you received to back up your position.